I once heard that Mormons can't eat fast food. Cursed is he that bears the name Ronald McDonald! No, members can eat at any restaurant they wish. I heard that the Mormon church makes members pay tithing by threat of death. Members are encouraged to pay a full tithe, and do so willingly. Free Agency is a central doctrine of The Church of Jesus Christ of Latter-day Saints. Tithing is one-tenth of a person's increase. All donations are confidential; in other words, other members don't know how much you are giving. Paying tithing is completely voluntary. Are Mormons vampires? Yes, and the Dalai Lama is Frankenstein. No, Latter Day-saints are not vampires. Do you celebrate holidays? Latter Day-saints can celebrate any holiday they wish. Latter-day Saints are Christians. Therefore, they try to emphasize the Christian message of Christmas and Easter. I heard that Mormons dance around a bonfire during Seminary, Is that true? 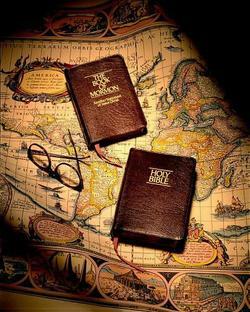 During Seminary, Latter Day-saints read and study the different Latter-day Saint scriptures. The atmosphere is similar to a Sunday School class. Isn't there a pagan star on the Salt Lake Temple? And what about the Wiccan-like practices in the temples? Wicca started in the 1900's, and the LDS church started in 1832. The star on the temple is not a pagan star. It is a Star of David—a symbol the Jews still use to this day. My pastor said we believe in the autonomy of the church. Why does the Mormon church act as one large group? The Bible says: "Now I beseech you, brethren, by the name of our Lord Jesus Christ, that ye all speak the same thing, and that there be no divisions among you; but that ye be perfectly joined together in the same mind and in the same judgment. . . . Is Christ divided? 1 Corinthians 1:10"
My local anti-Mormon guy told me that the Mormon church is not the fastest growing religion in the world. Church membership was 7,761,179 in 1990. As of the year 2009 church membership was 13,850,000 members. It is hard to prove who is growing faster, but the church is growing very fast, when many religions are losing membership. What about the prophecy about people on the moon? The claim is that Joseph Smith made a prophecy about people who lived on the moon at the current time and who dressed like Quakers. This was a rumor a man wrote in his journal 40+ years after the death of Joseph Smith. This journal entry is the only evidence of it. Joseph Smith never made such a prophecy or statement. I heard that Mormons cannot take a cola drink. The Mormons' law of health called the Word of Wisdom only forbids the use of tobacco, coffee, tea, and alcohol. Although members have been cautioned not to make a habit of drinking cola beverages, Mormons are free to drink a cola and still be in good standing with the Church. Why didn't the Mormon Church do something to stop that criminal Warren Jeffs? Jeffs and his followers are a completely different religion altogether. The Mormon Church can't tell other religions what to do. This page was last edited on 21 December 2011, at 21:27.